Printed in full color on premium polyester fabric with thin steel frame. 28"x48" Additional Message Size 6"x36". 36"x72" Additional Message Size 6"x64"
Human Directional Sign: Whether dancing, pointing, or even just standing, having a human hold your advertising is sure to catch the eye of passersby. Our Human Directional Sign is printed in full, captivating color on one side of premium polyester fabric. With a durable steel frame and a soft wearable neck rest, your sign will be sturdy yet comfortable. 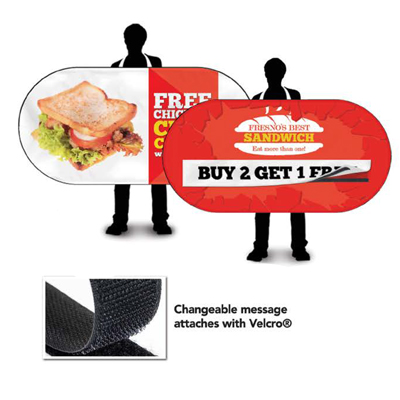 Your sign will be either 28”x48” or 36”x72”, and you can choose to add our unique interchangeable message option that allows you to easily swap out offers or promotions with Velcro. On the 28”x48” sign your interchangeable message measures 6”x36” and on the 36”x72” it measures 6”x64”. Our Human Directional Signs come with a storage bag and are available in increments of 1, 3, 5, or 10. Each order includes one directional sign and neck strap. Choose to include a interchangeable message.